Entergy had sequestered staff on-site prior to the storm. The NRC also had an inspector stationed on-site overnight. Reactor power was reduced to 75 percent overnight, per procedures, as the grid experienced voltage fluctuations. Operators started the plant’s two emergency diesel generators and transferred electrical loads for safety systems to those on-site power supplies due to concerns with off-site power. A third off-site power line, a 23-kilovolt line, remains available. However, the emergency diesel generators for now remain the primary source of power for safety systems. The reactor was safely shut down, with plant safety systems performing as expected. The exact cause of the loss of the 345-KV power lines is still being investigated. Entergy intends to take the reactor to “cold” shutdown. NRC inspectors will continue to monitor plant activities and efforts to restore off-site power, as well as any troubleshooting and repair work. The atmospheric stars have aligned once again to produce a powerful mid-winter storm aimed squarely at coastal areas in the Northeastern United States. Officials in a broad swath stretching from New Jersey to Maine have been warning residents to prepare for a blizzard that could produce prodigious amounts of snow, hurricane-force winds and dangerous travel conditions. There are several nuclear power plants in the storm’s path and the personnel at those facilities will not be sitting back and simply awaiting its arrival. Plant procedures call for multiple checks and preparations in advance of such a winter blast. Among other things, plant personnel will ensure that doors designed to prevent flooding are ready to perform their task; fuel oil tanks for emergency generators are appropriately filled; and the site grounds do not have loose objects which could become airborne amid strong winds and cause damage. On a related note, the NRC will be monitoring those preparations and stationing inspectors to keep watch on the plants as they weather the storm. An inspection procedure and checklist dealing with adverse weather protections will guide the inspectors as they conduct those assessments. It’s important to note that all nuclear power plants have technical specifications that dictate how they have to respond to a significant storm. As an example, if wind speeds are in excess of specified limits, a plant would have to shut down. Safety at nuclear power plants is never taken for granted, and that is certainly true when storms can present additional challenges for operators. The NRC will be keeping watch until the most potent storm of the winter of 2014-15 to hit the Northeast thus far has headed out to sea. An update on the status of Pilgrim is long overdue. You have left us hanging here! When I checked the daily status report on Pilgrim 1/30 it still showed it was out of service. In this case is no news is good news?! This plant has a terrible safety track record, you remind us of it, and then you give us the mushroom treatment when the plant has a significant operational event. Neil, I take issue with your headline use of the word “ready.” The operational event evidence says otherwise. And this is the same type of “blah, blah” you posted for hurricane Sandy. Has nobody noticed we are in a cycle of severe Mother Nature events? It seems obvious to me that the plant strategy for dealing with these severe weather events is at least worthy of a new look. If both the frequency and intensity of severe weather is increasing it has clearly changed the paradigm. My point is simple, the coping strategies remain entirely reactive and based on the time period of less frequent and less severe weather events. With Pilgrim the strategy seemed to be hang on connected to the grid and hope for luck that a grid disturbance doesn’t take us down. This storm was highly forecast. Grid disturbances in severe weather are the number one risk causing loss of plants during severe weather, yet the coping strategy remains entirely reactive to the event. They even had a red flag pre-trip during the event, they lost one off site power interconnect and sat with one generator output breaker open. At that point they are one single failure away from a LOOP and a trip, during the exact event most likely to cause the single failure LOOP. Gimme a break, it’s way past the time to rethink the strategy! When they lost their first interconnect they should have gone to “stable low load limit power”, kept the generator on-line supplying their own house power, but opened the other generator breaker to the grid, thus removing the possibility of a single failure LOOP during the storm induced grid disturbances. There is not a more stable machine than a nuke plant running supplying its own electrical power while unconnected from the external grid. It’s the way all navy plants run, all the time. But yet is apparently not considered a coping strategy. It is also a plant configuration all operators understand, as it is exactly where they are during start-up, before they connect the generator to the grid. Hurricane Sandy took two plants down due to grid disturbances (I believe), one was inexcusable as they choose to keep the plant connected to the grid as the forecast remnant eye track passed directly over the plant in New York. A similar (forecast) severe weather induced event recently caused the loss of two units at DC Cook and damaged their intake trash removal system. Because their coping strategy was entirely reactive, not pro-active. In that event a pro-active coping strategy might have prevented sucking a non-recoverable amount of suspended debris into the intake. Both plants might have survived on low load limit (at reduced Circ Water flow) until the severe weather passed and the intake trash removal system caught up. A cheaper and quicker recovery. It isn’t necessarily the NRC’s job to formulate these coping strategies, but you can at least stimulate the discussion by asking utilities if they are doing the best thing for the right reasons in light of the current weather trends. IMO, in the current severe weather strategy is not the best strategy, as it leads to plant trips, which always challenge the plant systems (Pilgrim HPI). With events that are going to challenge the grid and off-site power sources the least risky approach is to go to low load reactor limit supplying your own power, unhook from the grid, and ride it out. It allows the quickest recovery and least risk of plant challenges and damage. You will have a part to play, granting discretionary enforcement on TS required Off Site Power sources in some cases. But no, I don’t think everybody is “ready” for the current severe weather paradigm. When the wind gets to high levels (e.g., hurricane etc.) NO power plant can be assured of having a functioning external power source! It is only prudent to take precautions in such circumstances. Please see our post today for more information on Pilgrim. There were no issues at Seabrook. How many individuals in the USA ever predicted a LOOP at a specific plant at a particular timeframe and had the prediction openly documented on the internet two days before it happened? I think I am the first? The NRC documents 20 LOOPs at Pilgrim since 1980 (42 years of operation). I estimate the per one hundred year rate for Pilgrim is 55 LOOPs. Pilgrims relicensing documents say it is about 6.5 LOOPs per one hundred years. 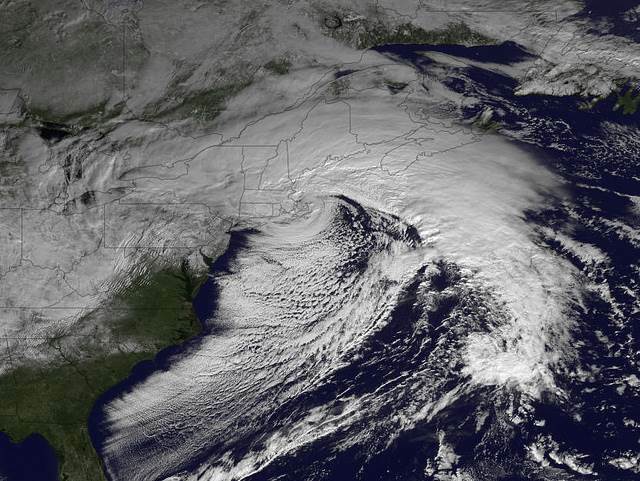 What is the bounding LOOP rate…pilgrim had three LOOPs in about three days during blizzard Nemo? That is an astronomical rate. I request the NRC use the worst case LOOP rate of about 55 LOOPs in all Pilgrim’s violation risk calculations and any other risk calculation used in Pilgrim. It gets you wondering what generic LOOP rate would bound all loops rate uncertainties? “This got to be an act of god: A blizzard that knocks Pilgrim off the grid on Jan 27 and this below inspection report is dated on Jan 26. It explains why Pilgrim has so many LOOPS and why the NRC remains inconsequential with controlling bad actor licensees. I yet can’t get a copiable document…have to wait till it gets on Adams. Did the agency see the blizzard coming in anticipation of the LOOP and decided it has to be released the IR yesterday! This is proof the agency seen the LOOP coming and didn’t force Pilgrim to shutdown prior to the storm. They should have ordered Pilgrim to shutdown 4 hours before the blizzard hit. This would have more caused them incentive to repair their fleet wide nuclear endeavors. It would have been invaluable for all the rest of the utilities to see. If you were god, would your release Pilgrim’s inspection report before the LOOP or after the LOOP? This is my proof that an intelligent god exist!!! I never needed any proof. Bill, why haven’t you put your hat in ring to be a NRC commissioner? I have to give “great” credit to the NRC for publishing my items! Thank you Victor. Sorry to hear of the shutdown of Pilgrim. That is a huge loss to the power grid at a time when the power is really needed. Sounds like the power grid was suffering pretty badly anyway and the plant was wise to separate safety loads from the grid and place them on those reliable on-site EDGs. I believe as long as a separate 23,000 volt off-site power source remains that it can backup the diesels as well. Moisture intrusion into the plant is probably the biggest current concern as the plant is being cooled down to a cold shutdown condition. Keeping heat in the plant and heat tracing systems going is important too. This is a time when the oft-condemned coal and gas-fired plants really demonstrate their worth to any utility and its customers. When the chips are down these are the old reliable electrical generation workhorses. Not many people probably realize that a nuclear power plant cannot even be physically started-up without that 345,000 volt off-site power. Some fossil-fired units are designed with a so-called black-start capability. If the entire electrical grid crashes, these units have batteries and diesels such that they can start up and restore power to the grid. Have you kissed your coal plant lately?! Any issues with Seabrook? Apparently that area is also getting hammered. I agree completely. Thank you. We should have stated that the limits on wind speed are defined in the plants’ Emergency Action Levels (EALs) and Updated Final Safety Analysis Report (UFSAR). While plants’ Technical Specifications do not contain explicit limits with respect to wind speed, the operability of the associated systems can be impacted by external events which may require a plant shutdown. For most plants, the Abnormal Operating Procedures (AOPs) and EALs will direct plant shutdown based upon actual and forecasted wind velocities to ensure the associated safety-related systems remain operable. I say all of you NRC people go to the power plants. We need something for your high pay. Very proper and important post NRC. I just wish you had left out that “related note”. It is very self-serving and tends to indicate you can “inspect in” quality at our nation’s nuclear power plants. Without these “stationed inspectors” I just do not think these plants could weather the storm?? This statement in the post is incorrect: “It’s important to note that all nuclear power plants have technical specifications that dictate how they have to respond to a significant storm. As an example, if wind speeds are in excess of specified limits, a plant would have to shut down.” There are no Standard Technical Specifications (STS) limits on wind speed and 3/4 of operating plants have TS based on the TSTF. Previous standards also did not have limits on wind speed. Therefore, there are no TS that require a plant shutdown based on wind speed. Also, the TS do not specify how a plant responds to a significant storm. I recommend deleting that paragraph of the post. For the NRC, a safe nuclear plant is a closed nuclear plant.